The Flag House is excited to be the newest Baltimore museum to participate in the Institute of Museum and Library Services Museums for All initiative. Through Museums for All, those receiving food assistance (SNAP benefits) can visit the Flag House and more than 300 museums throughout the United States for free or reduced admission simply by presenting their EBT card. Use the link to find a participating museum near you! Through Museums for All, those receiving food assistance (SNAP benefits) can gain free or reduced admission to more than 300 museums throughout the United States simply by presenting their SNAP EBT (Supplemental Nutrition Assistance Program Electronic Benefit Transfer) card. Find a participating museum near you or browse our full list of participating museums. Museums for All is a national, branded access program that encourages individuals of all backgrounds to visit museums regularly and build lifelong museum habits. It is open to participation by any type of museum — including art, history, natural history/anthropology, and general museums, children’s museums, science centers, planetariums, nature centers, historic houses/sites, zoos, aquariums, botanical gardens, and arboretums. The cost of museum admission can be a barrier for many low-income families. Participating museums provide reduced admission, ranging from free to $3.00, to visitors presenting their EBT card. This reduced rate is available during all normal operating hours to up to four individuals per EBT card. With a year-round open door policy, Museums for All invites low-income visitors to feel welcome at cultural institutions. Since the launch of the initiative in 2014/2015, Museums for All has served more than 1.5 million visitors nationwide at more than 300 museums of all varieties, representing 45+ states, districts, and territories. Museums for All is the only nationally coordinated financial accessibility program in the museum field, providing an easy-to-implement structure and the ability for participating museums to customize their implementation. 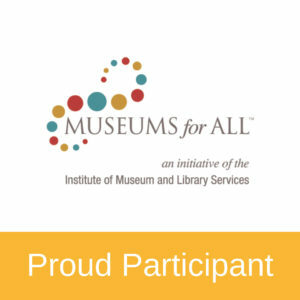 Museums for All is an initiative of the Institute of Museum and Library Services (IMLS), a federal agency based in Washington, DC. The initiative is administered by the Association of Children’s Museums through a cooperative agreement with IMLS.